Ideal for ID badges worn exposed to heat or direct sunlight. Prevents ID badge information and design from transferring onto the plastic holder. Quality product, met our expectations. We were re-making badges for keyless entry too frequently-this seems to be adding adequate protection to make them last longer. Our employees use these to protect their PROX cards and photo ids. I like the durability of this product. I like that our badges won't fall out of the cover and they do still fit through our timeclock. This badge holder is excellent. Badges are less likely to get dirty or fall out. Overall, will save you money because your employees aren't constantly asking for a replacement. Very sturdy. Excellent quality. I will buy this product again. This are very durable and will protect our name badges for a long time. Badge Holders are sturdy and hold up well. the product is used to hold our badges along with clips/badge reals. We use the badge holder with a lanyard. It is attractive, durable and easy to use. We have used these to hold our ID Badges for at least 3 years. They are very sturdy and remain clear. Great service. Fast shipping. Good quality product that is professional quality and well made. 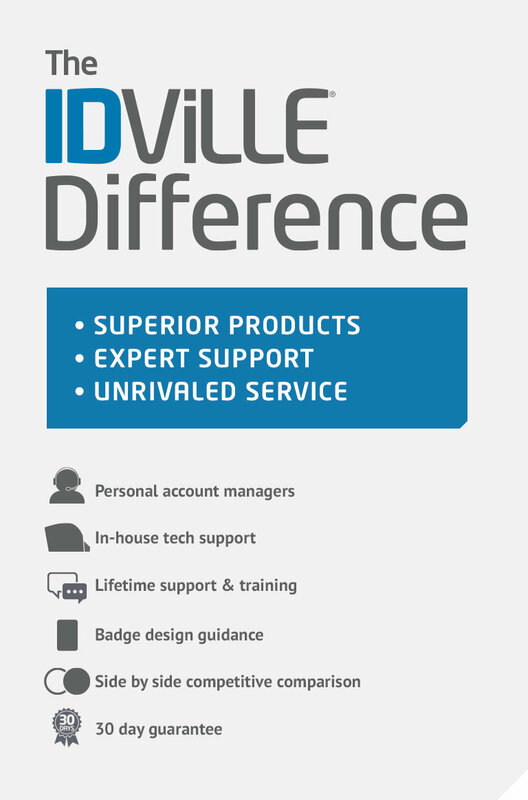 Would definitely use IDville products again and would recommend them. Very satisfied with this item. ID cards do not fall out and attches easily to lanyards. After trying different brands at different locations, I have finally found what i was looking for!!! This is a very STURDY badge! They do not tear like the others I had tried. It covers the ID completely and the the clip goes through both front and back. Others I had tried did not do that, you could only insert the clip through the face of the badge holder making it not sturdy enough and easy to tear. The quality of the plastic is superv!!! We purchased new ID Badge Holders and were pleasantly surprised in the difference in quality from what we had been using previously. We are likely to get a much longer useful life out of these! These badge holders are GREAT. They are very sturdy without being so ridged that they break. I definitely would recommend them. Here's the deal. These ID badge holders often also hold an HID card, and after a certain amount of time, usually a year or three, the bottom seam gives out, and the cards fall out. Kind of a drag. Other than that, they rock.